Rediff.com » News » Will winner take all in Tamil Nadu? As the election campaign ended in 39 Lok Sabha constituencies and in 18 assembly segments where simultaneous bypolls are on, a few questions remain upper-most in the minds of Tamil Nadu’s voters, political parties as also political analysts. The lone Puducherry Lok Sabha seat is also going to the polls, as also Kerala and Karnataka, but it is in Tamil Nadu that both polling and campaigning have been as exciting as it has always been. Question No 1: Will the ‘winner-take-all’ in Dravidian Tamil Nadu, a norm that has been taken for granted since the late charismatic actor-politician M G Ramachandran, MGR, launched the AIADMK as far back as 1972? Both MGR and his equally charismatic and at-times electorally more successful Jayalalithaa could not escape the effects of the electoral myth, when they both lost the LS polls from the state very badly, and when they were the all-powerful chief minister. MGR lost all but two of the LS seats to a stronger DMK-Congress combine, led respectively by bête noire M Karunanidhi of the parent DMK, and an Indira Gandhi on the upswing after the failure of the intervening ‘Janata experiment’. Jayalalithaa met her Waterloo (as BJP’s Subramanian Swamy would often say in other electoral contexts in her time), not once but twice -- in 1996 and 2004. Jayalalithaa had avenged it once earlier in 1991 in the company of the Congress party, after the Rajiv Gandhi assassination. She repeated the feat more recently in 2014, when her ‘Modi or Lady?’ challenge to the TN voter had better traction than the ‘Modi magic’ elsewhere across the nation. Yet, in between, Tamil Nadu had started shedding such perceptions and post-poll calculations based on the same. Despite the ‘Coimbatore serial blasts’, when DMK’s Karunanidhi was chief minister, the party-led combine still won a ‘high number’ of nine seats in 39 -- the first time it had happened since the AIADMK was founded. It was so also in 1999 and 2009, when the ‘losing’ AIADMK combine still won close to a dozen seats. The question now is if the Jaya-set 2014 record will hold again, or will the state revert to the post-1998 pattern, when a ‘clean sweep’ of the 1996 and 1998 of the kind was repeated only in 2004, by the DMK alliance? The 2004 defeat for the ruling AIADMK under Jayalalithaa owed to public perceptions of what was perceived as ‘high-handed’ economic policies, including the overnight sacking of a hundred thousand state government employees protesting for high wages, cut in paddy procurement by the public sector, leading to farm-distress, and steep rise in utility charges like power, water and public transport. Question No 2: Will the AIADMK state government of Chief Minister Edappadi K Palaniswami (EPS) survive an Opposition DMK-led ‘onslaught’, if any, in the 18-seat assembly by-election? The government’s legislative majority is hanging on tenterhooks after the Madras high court upheld Speaker P Dhanapal’s sacking of 18 MLAs identifying with the breakaway AIADMK faction, led by Jaya’s jailed confidante Sasikala and the latter’s more visible nephew T T V Dhinakaran. The by-elections are a make-or-break affair not only for the Dhinakaran-led ‘Amma Makkal Munnetra Kazhagam’, which is not a ‘recognised political party’ under Election Commission rules, because none was sought within the time but even more so for the AIADMK government. Question No 3: Does ‘Dravidian’ Tamil Nadu hase electoral space for any other party or group, including ‘national parties’ like PM Modi’s BJP, now ruling the Centre, to elbow their way in after shouldering out either one or both of the twin Dravidian majors? The question has been begging an answer for decades now, almost in every other election. This time. however, the question becomes even more relevant and equally challenging because this is the first time in decades that Tamil Nadu is facing the polls without the charismatic leadership of an MGR or his political heir, Jayalalithaa. Though their bête noire Karunanidhi was not as charismatic as the other two -- he being a powerful film script-writer whereas they were the most popular actors of their time -- the former holds the record for being the ‘elected leader’ of a recognised political party with a substantial following without break anywhere in the democratic world. That had created an aura of a kind, which the other two found it difficult to pierce, most definitely destroy, despite repeated attempts and relatively limited successes of their own. This is the first election that the state is facing without either Jayalalithaa or Karunanidhi. The two died respectively in 2016 and 2017, they having been irrecoverably taken ill one after the other. However, the political events and electoral developments up to now have shown that the two Dravidian majors may have survived all aftershocks of the exit of their respective leaders, with the new generation coming into their own, in their own different ways, between then and the elections now. If anything, unlike what national observers of the TN political scene had thought -- or, even hoped for -- elections 2019 has provided the occasion and opportunity for the new-generation leaders of the two parties to assert themselves within the party and project themselves as the future leaders of the state, competing as they do as parties, as used to be the case earlier. This does not mean that a reversal in this election could mean a re-alignment in the AIADMK, which went through post-Jaya hiccups in a big way, but settled in EPS’s favour with the benign intervention of the BJP rulers at the Centre. Depending on the seat-share and more so the vote-share, the AIADMK may be forced to reopen ‘merger negotiations’ with the Sasi-Dhinakaran camp, if the ruling party were to lose face, even if they were to win the required number of 8-10 assembly seats at the very least -- and sustain the government in the state. After all, the party would be facing the assembly polls anyway in 2021, and without Jaya around, the leadership may not want to risk a repeat of 2016, when she was around. The AIADMK did win a substantial number of 134 in a total of 234 (with polling for two seats countermanded, owing to charges of electoral corruption), the rival DMK combine, again for the first time, won a very high 98 seats -- the highest ever for an official political rival to the incumbent ruling party, and also the ‘loser’ at the end. Worse still for the ruling AIADMK in 2016, the vote-share margin was a very narrow one per cent, 41-40. The rest of the votes went to a hotch-potch combination of sub-regional parties that over the years and elections have been in the company of either the DMK or the AIADMK and had lost their sheen and strength by the time the Jaya-Karuna twin exits were supposed to be creating a ‘political vacuum’ in the state. Against the AIADMK’s unsure future just now -- or, at least until the poll results are known on May 23 -- the DMK seems to have a stable leadership under Karunanidhi’s long-serving politician-son M K Stalin. By knowing what not to do and say when the old man was around, Stalin has endeared himself to the rank and file of the party that worshipped Karunanidhi, who in an advanced age, too, would not give up a good politico-electoral fight, even when physically impaired and tied down to a wheelchair for years. With campaign hours closing down, there is a kind of uncertainty and lack of clarity all round, what with the EC’s shortened 21-day period for the purpose over the past couple of decades, taking the polls increasingly away from voter’s comprehension. Leave aside the alliance and seat-sharing talks particularly involving sub-regional and other minor parties dragging on until almost the last hour, the inevitable delay in the choice of candidates has meant that the voter hardly got to know their names, leave alone identity even for face-recognition in many cases. Yet, Stalin’s early declaration, projecting Congress president Rahul Gandhi as the DMK’s prime ministerial candidate did imply that the two parties would contest the polls together. Yet, his reluctance to talk the ‘minorities talk’ through much of the campaign and the DMK not directly fielding one of them in any of the constituencies may have dampened the communities’ enthusiasm overmuch against earlier expectations. Dhinakaran’s TMMK may stand to gain a bit, as in the R K Nagar by-poll, but it may still be too early to conclude either way. 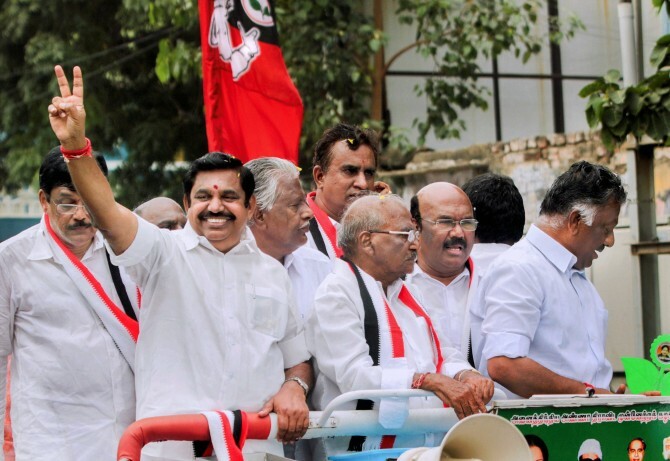 The alliance has the MDMK with about three per cent vote-share, and the VCK and the IUML with their selective strongholds on their side. The two communist parties, which were left to fight on their own in 2014 and polled a miniscule one per cent vote-share, are now said to be giving a tough fight in the DMK-Congress company, in four constituencies. For the ruling AIADMK-BJP combine, they have the election going in their favour -- but mostly on paper -- what with apprehensions of ‘double anti-incumbency’, if any, ensuring that they do sweat it out, until after the last minute. This is so despite the alliance, which includes also the PMK (5.5 pc vote-share in the 2016 assembly polls) and actor-politician Vijayakanth, with a perceived 3-4 per cent vote-share being in their company along with such other allies as Tamil Maanila Congress and Puthiya Tamizhagam with a much less vote-share, indicating that the alliance leaders would not want to leave anything to chance. Yet, the BJP might have unwittingly displayed early nervousness when as far back as mid-2016, the party was seen as wooing the AIADMK when Jaya was hospitalised first and died later -- mostly with elections 2019 in mind. Prime Minister Narendra Modi not visiting Jayalalithaa in hospital as against later calling on a relatively stable Karunanidhi in his home may not have been publicly discussed by AIADMK cadres. Yet, shedding his early shyness and/or reserve, when he would inaugurate official programmes and projects through video-conference from the state secretariat (as Jaya used to do after she became sick), EPS has used the poll campaign to reach out to every nook and corner of the state. Stalin once again did so in his own way, what with many of the second-line leaders choosing to contest themselves or tying down to the constituencies that they had got for their sons and other kin. One of them, DMK treasurer and former minister, S Duraimurugan, has become the centre of national focus after the EC cancelled polling in the northern Vellore LS constituency from where his son Kathir Anand is contesting on the party ticket after IT raid-teams recovering over Rs 11 crores said to be meant for distribution to voters and cadres, in sealed and named envelopes. The IT department has also summoned state minister Udayakumar after a raid on his room in the MLAs’ hostel. For all this, however, poll campaign in Tamil Nadu will not be over, here and now. After a couple of days’ break, parties and candidates are expected to take to the streets, this time in just four assembly constituencies where by-elections have been notified for May 19. The DMK has already named its candidates for the four constituencies, while the AIADMK has committed the support of all its allies, including the BJP, for all assembly by-polls being held now. The AIADMK is also said to be contemplating the possibility of having five other MLAs, either of the party or of minor parties who contested on the ‘Two Leaves’ symbol in 2016, disqualified, if only to keep the EPS reign intact -- depending, however, on the by-poll results in the current total of 22. It also implies that the AIADMK is more concerned about the assembly by-polls than possibly the LS polls, though in the later stages of the campaign for both, EPS and other party leaders were talking more in terms of supporting Modi for stability and security, than even listing out their own achievements, from Jaya’s 2016 mandate to the present day. But then, the BJP’s ambitions of replacing either of the two Dravidian majors in the state on an early date should stop just there.